Air bubbles in the index-matching oil that is used to fill the interfaces of the different lens groups in the collimator and camera have been a long-standing problem affecting both, GMOS-N and GMOS-S. The air bubbles develop when oil is lost from the lens interfaces and can have a measurable impact on the light transmission and image quality in the affected parts of the field of view. While some of the lens interfaces can be refilled during a regular instrument maintenance, other refill ports are inaccessible without a major intervention. Single GMOS-N twilight flat frame taken through the r'-fitler in 2x2 binning and slow/low readout mode. The 12 amplifiers have been mosaiced without any bias subtraction. For this frame the partial obscuration caused by the air bubbles is most prominent in the lower left corner of the frame. The air bubbles move with changes in telescope elevation and cass rotator angle, i.e. depending on the orientation of the GMOS collimator and camera lens groups with respect to the gravity vector. Since the oil is viscous, the bubbles have a long settling time of more than 30-40 min. For most configurations, the resulting obscuration will be prominent in the bottom part of the frame, but the exact location of the affected part is time-dependent. Typically, the bubble configuration and related obscuration will show small changes from frame to frame. The main effect of the air bubbles is an obscuration of light usually towards the lower part of the frame. The obscuration pattern can differ from exposure to exposure, depending on the telescope elevation and cass rotator angle and the long oil settling time. As a result, morning twilight flats may show a very different obscuration pattern than imaging exposures obtained in a different part of the sky at night. 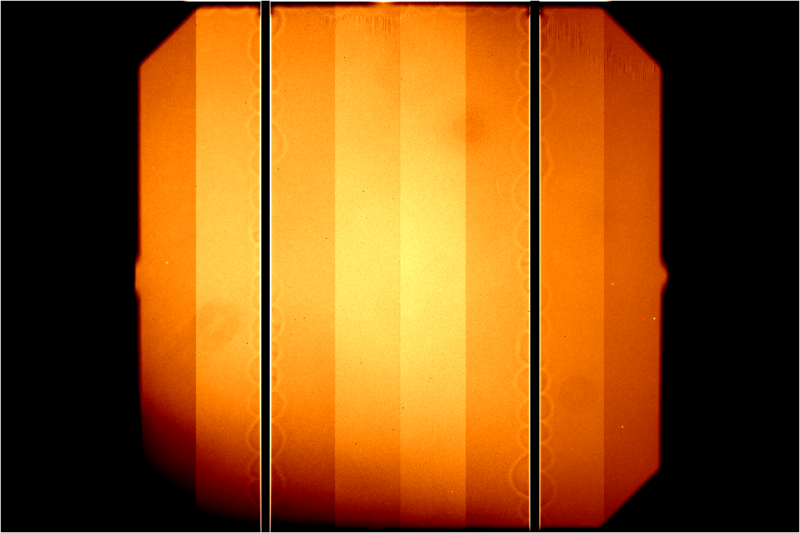 Tests with a GCAL-illuminated pinhole grid mask in GMOS-N have demonstrated that the parts of the frame affected by the air bubbles show a degraded pinhole image quality in addition to light obscuration. Whether the same applies to on-sky data and whether the air bubbles can affect astrometric accuracy is currently under investigation. The obscuration caused by the changing bubble configurations in the GMOS lenses can limit the flat fielding accuracy, in particular in imaging mode. The following recommendations may help to improve flat fielding during data reduction. Dark sky flat fields: Imaging programs are recommended to use a sufficient number of dithers, so that the imaging exposures themselves can be combined into a dark sky flat. The dark sky flat will provide the best-possible match to the air bubble configuration in the science data. This strategy may not be viable for programs targeting very extended objects. For very extended objects, the best option is to include some off-target sky exposures in the science sequences, analogously to the case of NIR imaging. This strategy has proven to be effective with GMOS-S. Taking at least three dithered sky frames of a nearby field with a low density of bright sources is what gives the best results. PIs of GMOS-N/GMOS-S programs who encounter issues with the data calibration or have questions about the best observing strategies are welcome to contact the GMOS-N or GMOS-S science teams at gmos_n_science 'at' gemini.edu or gmos_s_science 'at' gemini.edu.